Enterprise Specials Manager will make organizing vehicle merchandising easier, and will continue to increase dealers’ return on their website investment. DealerOn, the premier automotive website provider to 18 OEM programs, today announced a powerful, new vehicle merchandising tool for their multi-rooftop dealership website clients. Enterprise Specials Manager allows dealers to easily create and edit offers for one website, or across hundreds of websites with ease and efficiency. The Specials tool allows for easy customization, simultaneous edits across websites, and the option to share offers across multiple rooftops. Enterprise Specials Manager is yet another example of DealerOn’s technology continuing its trend of outpacing the market and providing dealers with creative solutions to help them sell more cars. “We strive to constantly improve our products and we believe in passing those innovations straight to our dealers. It is because of this commitment to transparency and value to our customers that DealerOn remains the only website company to have won the Dealer Satisfaction award from DrivingSales for the past seven years in a row,” said Amirrezvani. Enterprise Specials Manager was designed with user friendliness, efficiency, and utility in mind, and has many helpful features. 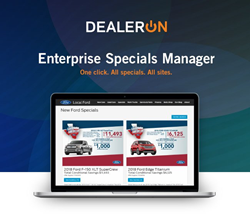 All dealers can now access Enterprise Specials Manager. To learn more, please visit DealerOn's website. DealerOn, Inc is a premier website & digital marketing company for auto dealerships, known for excellent, personalized customer service and its Lead Guarantee program, which guarantees dealerships a lead increase by at least 50% no matter their current provider. Since its introduction in 2009, the Lead Guarantee has delivered an average lead increase of 200% over the prior provider for DealerOn dealerships.